Although Montreal en Lumiere is long gone (the next edition is February 20-March 2, 2014), the art of the winter festival continues on. 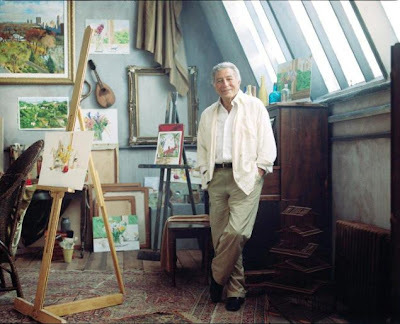 Montreal en Lumiere and the Galerie of the Maison du Festival Rio Tinto Alcan are presenting the Canadian premiere of Tony Bennett: The Art of Anthony Benedetto through April 14, 2013. The exhibit of 40 art works by the internationally renowned artist and singer is on display at the Galerie and is free to the public. A popular performer in Montreal, Mr. Bennett created a piece titled Louis Armstrong when he was a guest artist in 2000. For the 14th edition of Montreal en Lumiere in 2013, he created this exhibition of some of his loveliest pieces, signed Anthony Benedetto. They include 41 watercolors and two sketches created between 1986-2012. Three of them are original paintings that are part of the permanent ocllection of the Smithsonian Institution in Washington DC. The Galerie is permanently installed on the second floor of the Maison du Festival Rio Tinto Alcan. The non-profit organization showcases the original works of the Festival International de Jazz de Montreal collection. They include creations of Jean-Paul Riopelle, Marcel Barbeau, Corno, Armand Vaillancourt, Francis X. Pavy, Zilon, Lhasa de Sela, Miles Davis, Frederic Back, Miyuki Tanobe, Diane Dufresne, Richard Seguin and Yves Archambault -- the festival's poster designer for nearly 25 years. The Galerie also has limited-edition signed and numbered silkscreens, including works by Robert Lapalme and Alfred Pellan, available exclusively at the Galerie. Also located at the Galerie is the Bell Exhibition of the Legends of the Festival, a small museum with a display of instruments, stage clothing, trophies and personal items from some of the jazz performers over the past 30 years. They include costumes worn by Miles Davis and Ella Fitzgerald, guitars of Jeff Beck and Ben Harper, and the legendary hat worn by Leonard Cohen. On the third floor is the Mediatheque Jazz/La Press and its collection of archives including the works of journalist Len Dobbin, jazz magazines, photographs, CDs, video recordings and archives. Hours are Tuesday-Wednesday, 11:30 AM to 6 PM and Thursday-Saturday, 11:30 AM to 9 PM. Closed Mondays. The Galerie is located at La Maison du Festival Rio Tinto Alcan, 305 Ste-Catherine St. West, Montreal. Free Admission.